Even though the temperature is rising, you don’t have to compromise comfort or style. The lazy days of Summer are almost here. Whether you want to admit it or not you probably have at least one pair of flip-flops in your closet. While thankfully the whole trend of wearing them everywhere has passed (that’s so 2005! 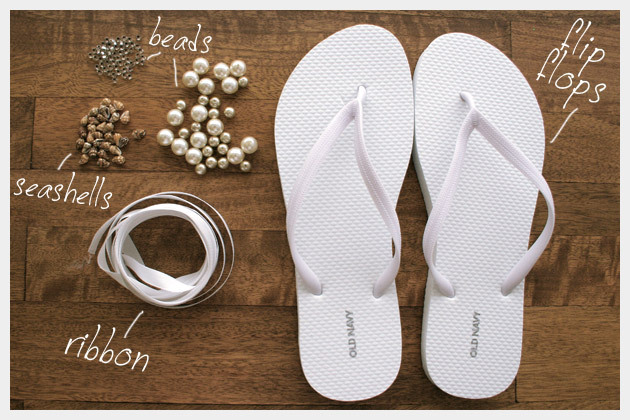 ), but if you’re vacationing at the beach or just bumming around on the weekend you definitely need a fancy pair of flip flops to take your casual beach look up a notch and this DIY tutorial to make your own beaded flip flops, is just the way to do it. To see step by step instructions and photos click here. 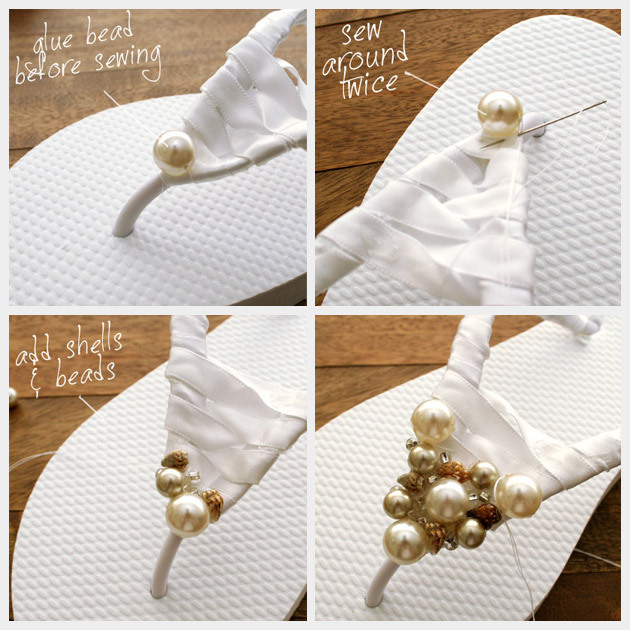 Place a small amount of hot glue on the outside of the flip flop strap at the base and attach the end of your ribbon. 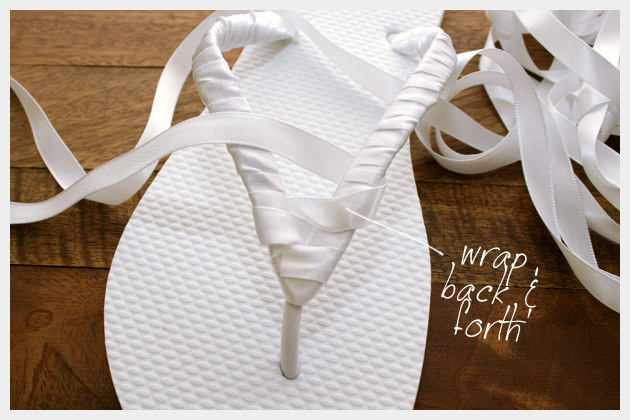 Continue wrapping your ribbon around the straps on your flip-flops until they are completely covered. Add small amounts of hot glue to hold your ribbon as you go and secure the end when you are finished with hot glue as well. 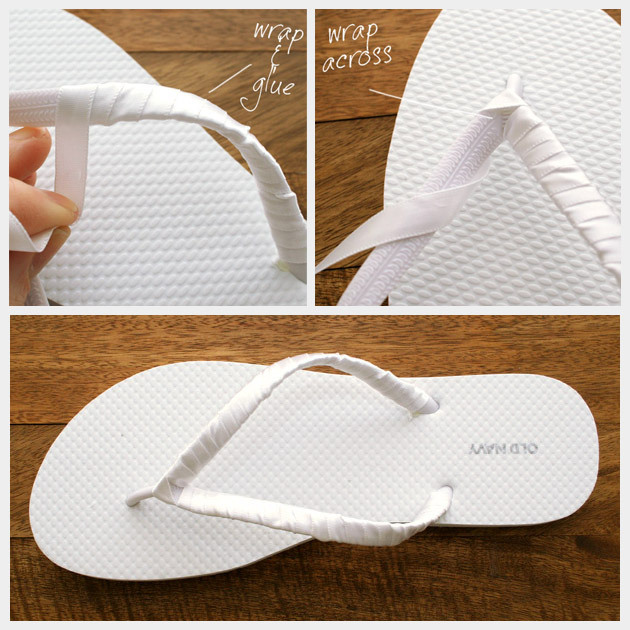 Take your ribbon again and wrap it around and back and forth across the center "V" of your flip-flops to fill in. Be careful not to make your "V" to high or if you really do want it to go higher, make sure you wrap it loosely otherwise it will be difficult to get your foot into. You’re ready to start adding your beads. Add your beads one at a time sewing them on, (I put a small drop of hot glue under all of the large and medium sized beads as well as the seashells before sewing them). I stitched through each bead 2 times before going on to the next bead. So whether you’re just hanging out at home or on vacation at some exotic beach (oh I wish!) you really need to elevate your foot wear with some beads and seashells. 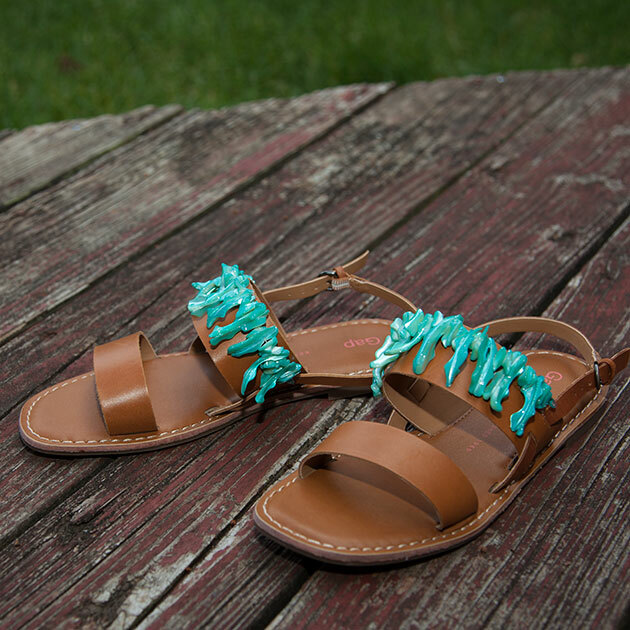 These beaded flip-flops bring to mind thoughts of Palm Beach, tans, and some serious relaxing. I don’t know about you but I am soooo ready for Summer. 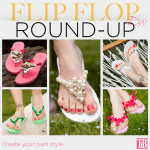 I can’t wait to hear how your flip-flops turn out leave a comment below and let me know. Great idea! I’m putting this on my diy list for next summer! Wow.. I really love this. Where can I get beads from? 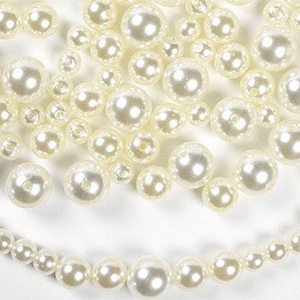 You can by strings of glass pearls at Michaels Craft Store for about a dollar. 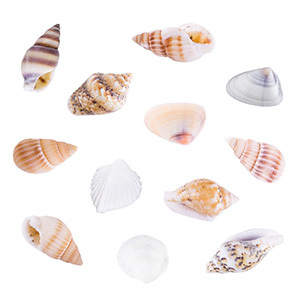 Same with the shells. Michaels or JoAnns fabric are good places for beads. 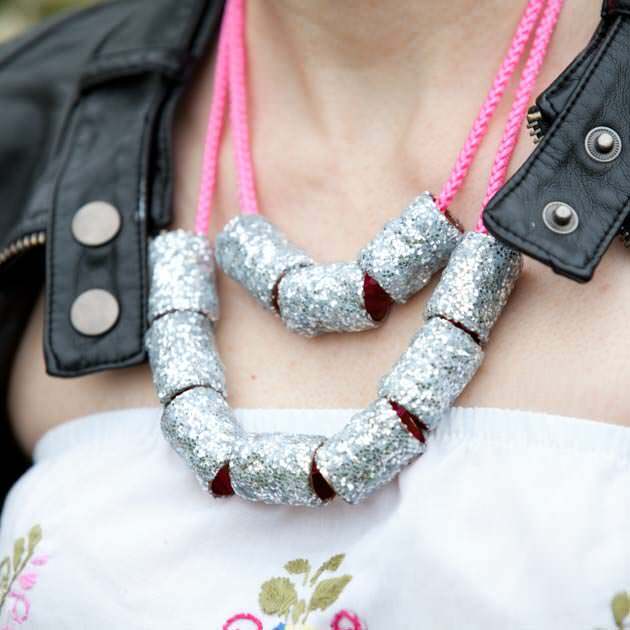 Sometimes you can also find great necklaces at Goodwill or other thrift stores, you can cut them up and use the beads. I realy love it. you are so greative. You can get beads at Walmart…they have a pretty good selection of inexpensive beads that look expensive for this type of project. These are 2 cute! 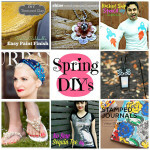 I will be featuring your DIY on my blog site tomorrow. I think these would be great for a bride using flip flops at her wedding. Nice job and thank you for sharing. Thank you so much! I agree, I think these would be great for a bride, perhaps for a beach wedding. Do you think i could just use glue, and not sew it? thanks! Yeah, I’m sure you could. Just make sure your beads are really secure, since shoes get a lot of wear you just want to make sure your beads stay on. Good luck! How do you sew beads on? Are there holes in them? Sorry, I’m not a crafty person. There are holes in beads. You can see one in the example picture above that reads, “glue bead before sewing.” The hole goes right through the middle of the bead (like on necklaces and bracelets). To sew the bead on, you’ll need needle and thread. 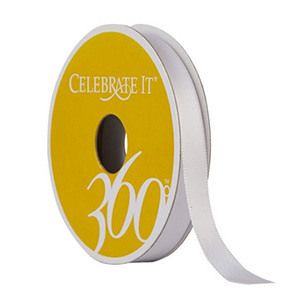 Tie a secure knot in the thread and secure it to the ribbon (sew it onto the ribbon). You can cover up the knot with beads. Spear a bead through its hole, and sew the thread through the ribbon again, pulling the bead flush with the ribbon. Sew through the bead a second time for added stability. Cathy also recommends you glue the bead onto the ribbon before sewing so that should help you stabilize the bead as well. When I’m working with beads, I like to keep them contained somehow (or else they’ll roll all over the place and I’ll lose a few). You can keep them altogether in any kind of lipped container–a bowl, a shoe box lid, a small lid of any sort–if the beads you have didn’t come in a container. Holly explained it perfectly, they do have holes in them and most sewing needles are thin enough to easily pass through any beads you might use. OMG This is so inspiring. I have been posting my thrifty ideas and garden updates here: http://busymomsdoitbest.blogspot.com/2012/05/happy-memorial-day-in-honor-of-memorial.html# I would love for you to check it out. Thanks again for sharing. whao… those flip flops are so amazing! Lovely. I liked it a lot. 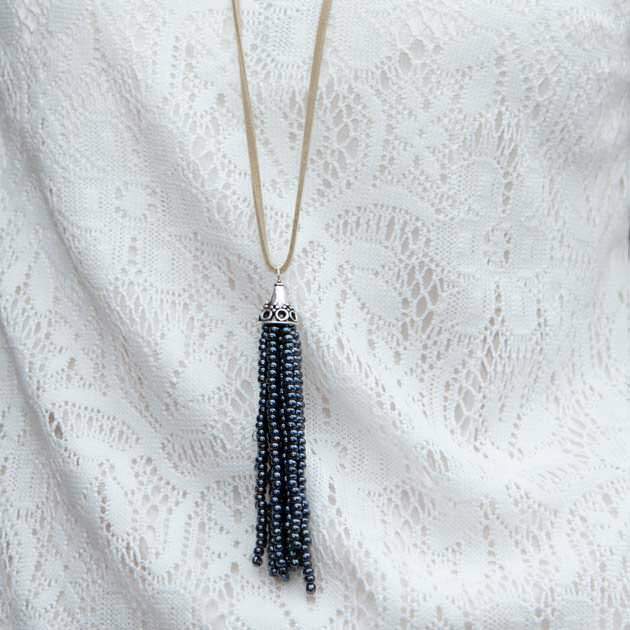 It’s super easy to make and Super stylish to wear. What a lovely idea! I’ll have to try this when I find some flip-flops on sale. 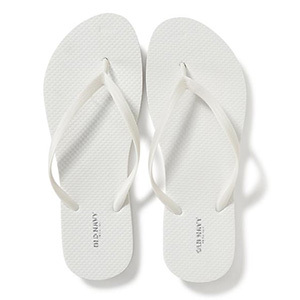 Old Navy is having their $1 flip flop sale this Saturday, June 28! Where’s your Pinterest button??? This is a cute idea for a bride, and I may end of making them for a bride next month @ their beach wedding. Thanks!! This is an absolutely amazing idea! I am totally doing this but with a slight twist. I am thinking more on the lines of black flip-flops & colorful crystal beads. What do you think? I think black flip flops with colorful crystal beads would be gorgeous! Let me know how they turn out! Send me a picture! I made a pair of these and they are lovely! My thongs were really twisted (cheap shoes) so I didn’t do the little V over the toes, but they still turned out really well! I just used Tacky Glue from Joann’s and didn’t sew them; it worked but it took longer because I had to sit there and hold them until they dried. Since I didn’t sew them I don’t plan on wearing them everywhere, but whenever I do I get tons of compliments! Thanks for making such easy projects! Please explain how you did the V a little. Is it under and over sort of like a shoe lace? Or keep going wrapping like you did the strap? I did it over and under, kind of like a figure 8 or a shoe lace ;). I made these and I followed your directions. It took a little longer than expected but it was worth it. They are very cute and I plan on wearing them often. The only place that I deviated was that I used blue ribbon and flip flops instead of white. Also, I used larger seashells and put buttons on them. I thought this was pretty easy and the result was very cute. 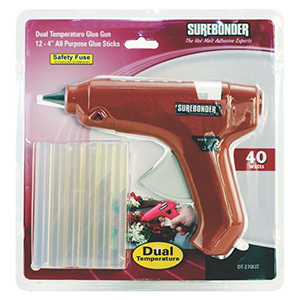 They seem very sturdy and it was a good way for me to practice my sewing. Thanks for putting this up! hey I like it very much, and share here!! These are great do you sell them? I think someone has stolen your idea without giving you credit :( Boo! I hate that! I first found you on here http://www.popularpix.com/pic-77.html, but eventually tracked down your blog post after some google searching. Great tutorial and super cute results! I just made these, they are awesome! Thank you for the project idea! Hello:) I absolutly love your step by step guide on how to achieve creating these. I am currently creating a Youtube channel based on D.I.Y projects. I would very much like to use your step by step guide on creating these shoes in my next video. Would that be alright with you? I apologize for responding so late. Thank you so much for asking, I don’t mind you using my projects at all, as long as you give me credit and link back to Trinkets in Bloom. That’s totally fine. Thanks! I’m so glad you like them!! I thought this would be a fun little project for my daughter, step daugher and myself to do together. It was a bit complicated for them (they are 15 and neither of them had ever sewed before). Two of the pairs (mine and my step daughters) turned out great. My daughter gave up after one shoe then tried to hot glue the beads on the other shoe which didn’t turn out for her that well. Since there were three of us, it was a bit costly of a project since we needed to buy all the beads. We all picked out a different color flip flop and all three of us had different taste of beads. We figured after it was all said and done it cost about $20 per pair to make. I know this sounds like a negative comment and I don’t mean it to be. I absolutely LOVE the pair I made myself (i stuck with the white flip flop and used, pearls, turquoise beads, silver roses, and copper sea pearls). My step daughters came out the best. She bought black flip flops and used turquoise ribbon and her beads were turqoise, copper, black and white. She used the entire package of beads so they are really full. My daughter bought gray flip flops, silver ribbon and her beads were all pearls in different sizes of muted pastels. It kept us busy for a few hours so it was fun family girl time!! Thanks to pinterest I found your idea!! Thanks for sharing! 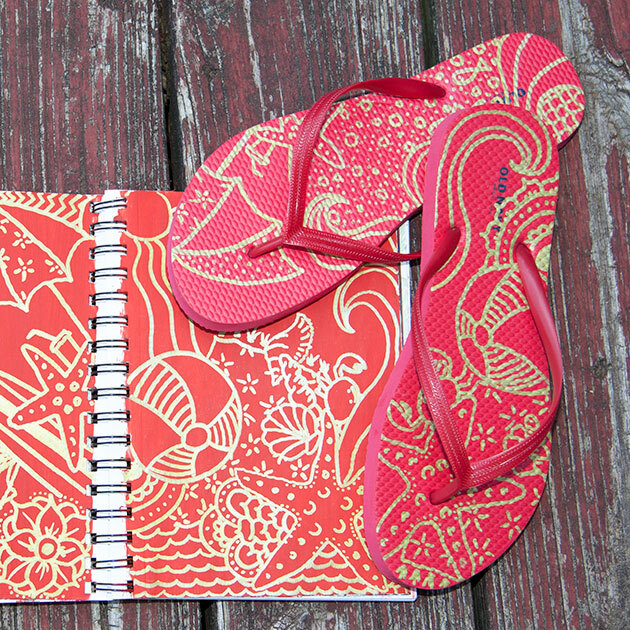 All your flip flops sound beautiful and it sounds like you had a lot of fun making them together!!! That’s the best part! These are way to cute. After two foot surgerys I can’t wear flip flops long but my grand-daughters would love these. Thanks for sharing. I’m so excited about these flip-flops, I have all the supplies I need to make then, can’t wait till I’m done, and there on my feet!!! Thank you for the great Idea!!! thank you so much for sharing how you made these! what alovely project…! Hi cathy, I’m from Indonesia. Thanks so much – this was exactly what I was looking for. The criss crossed section rocks – what a great idea! Can’t wait to get started. 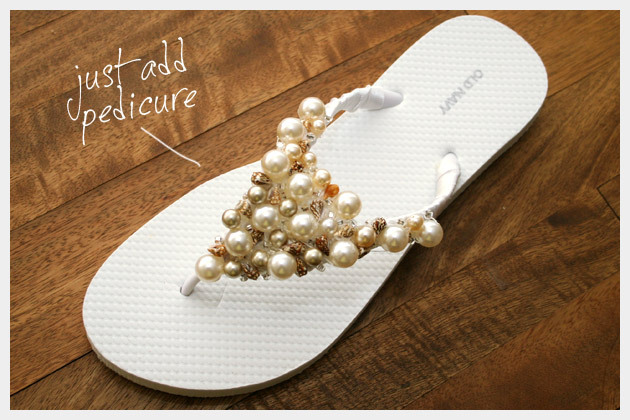 Perhaps an addition of jeweled ribbon around the outside of the flipflop could offer more ‘fancy’ to the project….. I have all the supplies, I am making 12 pair! My girlfriends and I are in a fundraiser in April (I have myself plenty of time) to raise money for cancer. We have to wear matching tee-shirts, so I thought it would jazz it up with these flip flops. I went with black flip flop, cherry red polka dot ribbon and jewels. Hopefully they will be a georgous as yours, thank you so much for sharing! That’s so amazing! I would love it if you’d send me pics when you’re finished and I can promote what you’re doing on facebook. I liked your flip flop idea that I made my own bead flip flops too on my blog. I posted a link of your blog to my blog post. I hope you don’t mind if I linked your blog to my blog. I am getting married August 17,2013. And I am making these for all the girls in my wedding. We all love them! What a very cute idea. absolutely great! I re-made mine just like you described, I just used my bijou stuff I do no wear anymore for the beads. Thank you for this easy, fun and creative tutorial! I just wanted to let you know that I am featuring these flip flops on my blog today… they are simply beautiful and feminine. Being a cowgirl kind of girl I seldom wear flip flops but I thought these were so cute I wanted to make some. I used turquoise flip flops, bandana ribbon with turquoise stones, silver beads and little horse and cowboy hat buttons. They are so cute! Thought I might some more using red flip flops and blue denim material instead of ribbon. Also making some for my neice that is having a beach wedding. I wanted to ask you, is it ok, that I use your picture? I shared the link to, so the people can go to your side too. By this I mean, that they see the owner of the picture. If you don’t want it, please write back, and I will delete it immediately. I would be very happy to share your pictures and ideas! Thank you so much for asking me and for sharing! I appreciate that you only posted the feature photo and a link and not the entire tutorial. Yes, it’s fine. In the future if you want to share any other photos it’s fine if you post them this way with just the finished photo and a link. Hi, congratulations you are very clever. Could I please have the instructions/tutorial of your beaded sandals n the gladiator sandals..
great ide! I would like to show it on my blog: http://www.takko-fashion.com/de_de/xpressed.html. Of course, you will identified as the copyright and also linked. Can i get your permission? Thank you for asking. Yes, you can share it on your blog. I just ask that you don’t share the complete tutorial. You may show the finished photos with a link to my site for the tutorial. Please send me a link when it is live. Thanks! In cant wait to do this flip flop craft with my brownies class I really think girls will enjoy this fun craft and it is for theirself. What on earth does sew around mean, I’ve been trying to figure it out for the longest! Do you sew it through the ribbon or around the flip flop? I love these! They immediately make your flip flops fancy! 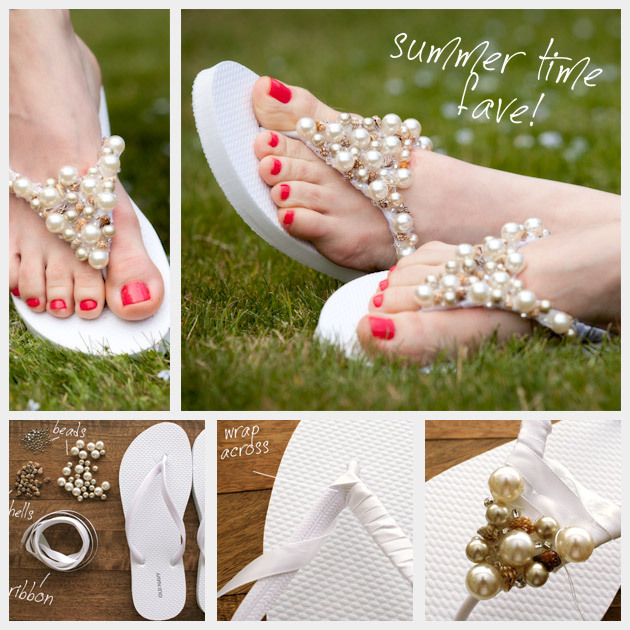 We shared your idea with the readers on our blog at http://creative-party-themes.com/diy-flip-flops/. I enjoyed making these beaded flip flops. Would love to post a pic. I would LOVE to make a pair of these for my daughter! At her wedding she looked like a princess with a beautiful tiara. She now has 2 daughters 4 an 2, but she is still alllll girl! I just have a quick question. BTW – THANKS so much for the detailed instructions and this great project! You are so talented!!!! Anyway, my question – do the seashells have holes in them, and oh, yeah – when sewing on the pearls, do you take the thread all the way down through the ribbon and then back up? What do you think about using mono filament thread (like fishing line) instead of regular thread? Could I use strong button hole thread? I knit, crochet, do plastic canvas and a little origami here and there, but not so much sewing. Although I am very patient when making projects. Thanks!!!! Susan Have a Blessed Day!